New Release. 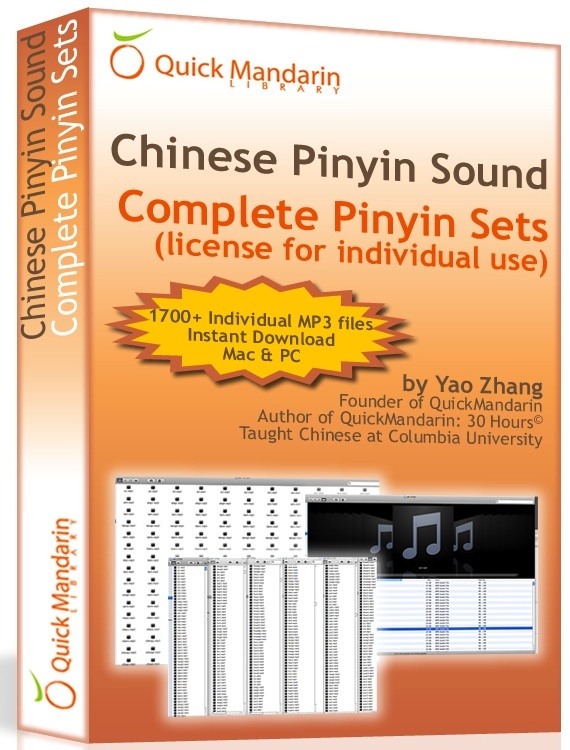 Complete Chinese Pinyin Sound - over 1700 individual MP3 files to facilitate the assimilation of Pinyin pronunciation and Chinese tones. Quick Mandarin was originally founded by Yao Zhang in 1999. Inspired by his own adventurous foreign language learning experience, he created Quick Mandarin to promote his idea to teach people to learn Chinese efficiently, tailored to Chinese learner of all levels. Yao currently teaches Chinese at Yao Mandarin School. Quick Mandarin - Quick stands for efficiency. Like learning any languages, we at Quick Mandarin believe that learning Chinese is a big project and takes a lot of efforts and determination in order to succeed. We don't promote shortcuts for learning Chinese, there is none! However, the idea to learn Chinese efficiently is a reasonable and achievable goal by integrating the right method and approach in your learning process. If you are learning Chinese or wish to start to learn Chinese, Quick Mandarin can help you in many ways. 1. Quick Mandarin publishes learn Chinese textbooks through Quick Mandarin Library. Check out and order books published by Quick Mandarin Library now. 2. Quick Mandarin provides both online and offline learn Chinese software/program and learn Chinese audio/video materials supporting you to learn Chinese efficiently. 3. Learn Chinese Podcast (LearnChinesePod.com). If you just started to learn Chinese, you will find this Learn Chinese Podcast a simple, fun and easy-to-follow introductory course.